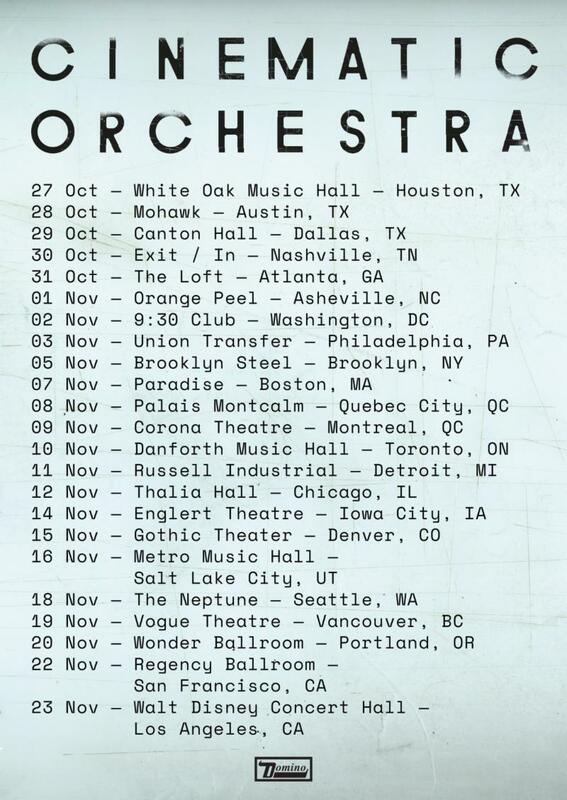 The Cinematic Orchestra have announced their first US tour in over a decade, an extensive nationwide run that includes - in addition to a very special, already announced show at LA’s Walt Disney Concert Hall on November 23rd - stops at NYC’s Brooklyn Steel, DC’s 9:30 Club, and many more. Full tour routing below. On the instrumental ‘Lessons’, a melodic, melancholy meditation is built around Luke Flowers’ drums, driving the track’s ebbs and flows of energy. The saxophonist is the ever-present band member Tom Chant, who in many ways embodies the evolving symbiosis of the band: a friend-of-a-friend turned studio partner turned bedrock of the band’s live formation over two decades. ‘To Believe’ has earned praise from NPR Music, who dubbed the album “soaring, rich,” saying, “there’s an incredible range to this record,” and The Guardian, who called it “heartbreakingly brilliant.” Uncut said, “never more cinematic, nor more orchestral...no-one else combines dignified grandeur and soulful romance so effectively.” See below for The Cinematic Orchestra’s full international tour routing.